These Kattilou shoes with a contemporary, casual look in soft suede are a superb day time or weekend shoe with their unique rubber evergreen sole, patented by Geox, they will keep you cool on a hot summer’s day. Breathable women's hybrid shoes with a contemporary, casual look in soft suede. These Kattilou shoes come with an exclusive Geox-patented perforated sole that maintains the optimal micro-climate inside the shoe. The memory foam insole provides your feet with additional comfort, while the EVA sole ensures cushioning, flexibility and lightness. The soft silver suede upper features a glittery finish and lovely perforations. These are the perfect shoes for adding a contemporary, trendy look to more casual pairings too. Breathable slip-on hybrid shoes that offer outstanding cushioning. With their contemporary design and modern look, these Janalee hybrid shoes are perfect for finishing off casual outfits. 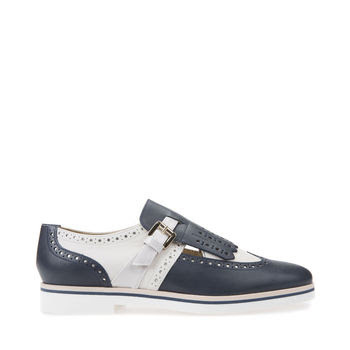 Perfect for when off duty, they come with a navy blue and off-white nappa and leather upper decorated by a tassel and brogue detailing. The slip-on construction makes them easy, quick and practical to get on. The Geox-patented perforated sole ensures outstanding breathability to provide absolute comfort and high performance. The TR tread also ensures outstanding grip and resistance. Casual women’s loafers that are breathable, light, flexible and cushioned. These Thymar loafers represent the perfect blend between glamour and comfort, merged within a hybrid shoe with a contemporary design. Featuring a practical and comfortable slip-on upper in metallic silver, they are embellished by lovely ruches and come with a breathable perforated sole - a Geox icon - for the utmost comfort. The EVA sole also optimises the feeling of well-being, ensuring lightness, flexibility and cushioning, which is taken to whole new levels by the memory foam insole.